By Kristen Lomasney on Oct. 2, 2017 at 4:12 p.m.
New York Comic Con is upon us! Here's where you can see Adam at NYCC this year, and what you at home can look forward to later. 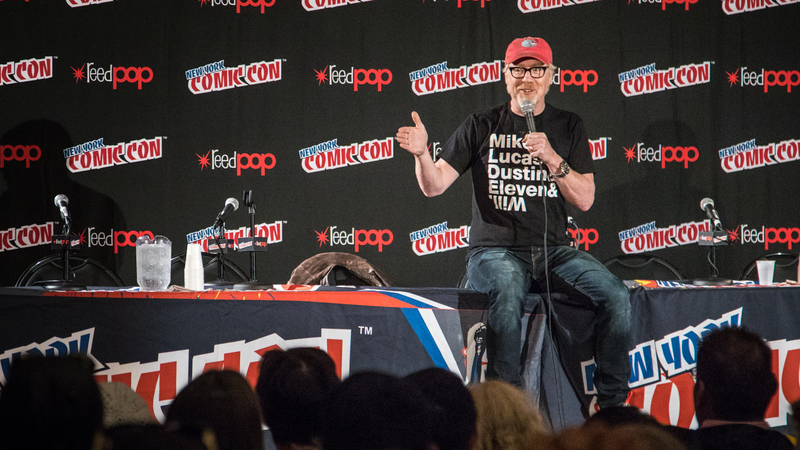 Last year was our first New York Comic Con, and we had a blast. Here's Adam's public schedule this year, and for those of you who cannot be there, some of this will be LIVE STREAMED. Plus of course lots of video on Tested afterward! One note: NYCC is sold out except for Thursday. Information on tickets can be found here. Stay tuned to Twitter (@donttrythis), because we'll Tweet when Adam is hitting the floor in his first Incognito costume. The first person to identify Adam will get two passes to his panel with Neil deGrasse Tyson later that day. Adam did this last year, too. He'll stop by the NYCC Twitch stage for a short chat, which you at home can stream on NYCC's Twitch. Did you hear Adam has written a book with Drew Curtis? Yup, it's called Don't Give Guns to Robots: Choosing Our Future Before It Chooses Us, and it's available for pre-order on Amazon. On Thursday at 5 pm, Adam will be signing posters with his buddy and co-author Drew Curtis at the Simon and Schuster booth (Booth #2128). This is a free but ticketed event; only 150 posters will be signed. Drop by the booth any time before 5 pm on Thursday to pick up your free ticket. One other note: This year fans will have two options to reserve a seat in a main stage panel. Instructions are on the NYCC site. Again, dial in to Twitter (@donttrythis), because we'll Tweet when Adam is hitting the floor in costume. Since MythBusters ceased filming two years ago, Adam Savage has been quite busy. He's logged almost 175,000 flight miles and visited and filmed on the sets of multiple blockbuster films (including Ghost in the Shell, Alien Covenant, The Expanse, Blade Runner), AND built a bucket list suit of armor to cosplay in (in England!). In addition he traveled to more than 70 cities for his new Brain Candy stage show with Vsauce's Michael Stevens and for his Maker Tour series on Tested.com. But this panel is about the fans. For his second NYCC appearance, New York native Adam will answer questions on everything from his past to his present to his future. One cool thing about this panel: It will be live-streamed by Collider on their YouTube channel! Also: Attendees will receive a VRV trial-period card, which will allow them to watch Adam's Excalibur armor series! Another note: This year fans will have two options to reserve a seat in a main stage panel. Instructions are on the NYCC site. Adam's doing his annual (free) signing for folks in Hall 1B Autographing Area Table 21. (Free) tickets have already been awarded in a lottery, but we'll have a few "golden" tickets for superfans at the signing itself. Again, for those of you who can't be at New York Comic Con, please know we'll share everything we can live as it happens, and then more on Tested.com when we get back!